Discussion in 'Pin Showroom' started by TammyH, Sep 16, 2018. OK... it's taken me a lllooonnnngggg time to do this, but I finally created this. I really did enjoy doing the quest. 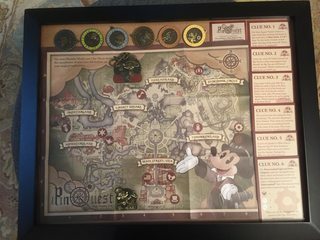 I received a Disney gift card as a birthday present and this is what I did with it. watzshakinbacon, coblj003, slbrabham and 1 other person like this. Nice! Would love to see a bigger pic! Nice job. The frame looks lovely. Jack Skellington, timeerkat, cyke23 and 3 others like this. Looks great. Glad for the larger picture.